The New Britain Bees Fundraising Program is a great way to raise money for your non-profit organization while also supporting your local baseball team. 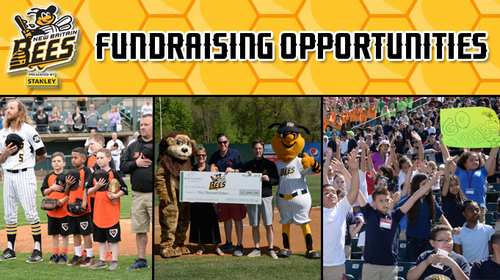 Non-profit organizations have an opportunity to raise up to $5.00 per ticket sold with the Bees. Benefits of a group outing fundraiser include discounted tickets, the chance to raise money for your organization, the ability to enjoy a Bees game with your group from a block of seats, and a scoreboard message welcoming your group to New Britain Stadium. All you have to do is contact a Bees representative, and we’ll take care of the rest. Other group opportunities include National Anthem performances, a Dream Team outing for youth sports team, and pre-game, on-field performances and demonstrations. For more information about booking a fundraiser, please call (860) 860-BEES, email tickets@nbbees.com or visit www.nbbees.com.